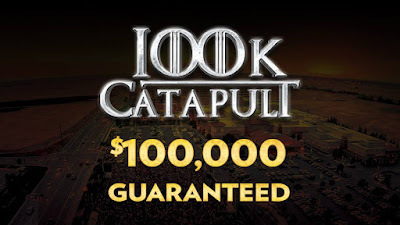 The largest-entry poker tournament in the northern California region returns to TVPokerRoom as the $160 Catapult's opening flight has just begun. There's a $100,000 guarantee on this 5-starting-flight tournament. Players begin with 12,000 chips and play 20-minute levels for the 6 levels that registration is open. Once the starting field is set, play moves to 30-minute levels. Ten percent of each starting flight cashes, and 8 percent of the field moves on to Sunday's Day 2. Click Here to check out the structure for this and every tournament in the 2017 Ante Up Worlds.